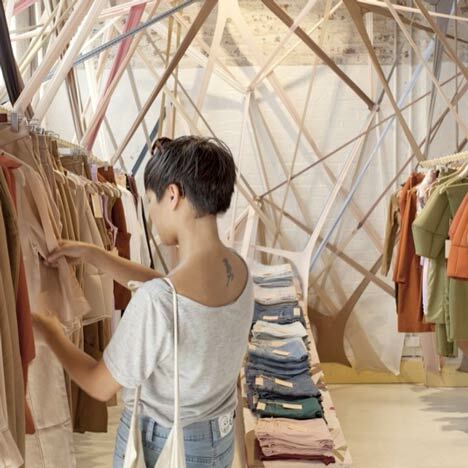 Australian studio Edwards Moore have stretched tights across the walls and throughout the interior of this pop-up fashion store in Melbourne, Australia. Created for Australian fashion brand Arnsdorf, the temporary store was opened for just three days and featured 154 pairs of tights stretched and wrapped around the space. Photographs are by Tony Gorsevski. A cave-like space, providing an intimate setting and backdrop for the Arnsdorf’s Opticks Collection. Inspired by crystalline forms, superman’s fortress of solitude and imagery of rocky landscapes, we reinterpreted an everyday wearable item - stretching and wrapping it to envelop the space in soft hues and showcase the sculptural collection.